Optimized for the small and medium classroom, boardroom and focus group environments, the ResponseCard IR keypad is light and compact enough for teachers, consultants, presenters and trainers to carry them from room to room or with them during travel. The lightweight, rugged, durable clicker and receiver fit into a custom binder for easy portability. 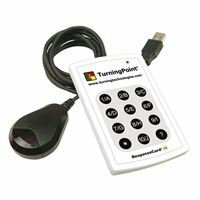 TurningPoint, interactive PowerPoint® software, can achieve two-way verification with the ResponseCard systems via a displayed response grid on the screen. As each participant submits a response or changes a previous response their clicker ID will acknowledge the response by changing its appearance. Educators and presenters will know immediately the participation level of their group. ResponseCard IR is compatible with IR Receiver and TurningPoint assessment software. (INCLUDED) Turning Technologies developed the Infra-Red (IR) Receiver for the small and medium audiences. It is a compact, lightweight, wired receiver that is perfect for consultants, presenters and trainers to carry from room to room or across the globe. With its "line of sight" technology, IR Receiver operates just like a remote control, making setup and operation easy for speaker and participant. Use reliable IR technology to transmit responses in small, secure environments with no RF interference. Responses are communicated accurately, timely and effortlessly from clicker to receiver. IR receiver is preloaded with a device driver, requiring no installation of driver software to the presenter's computer. All IR technology is compatible with Turning Technologies' TurningPoint assessment delivery and data collection solutions. IR Receiver compatible with Turning Technologies' ResponseCard IR. Brand new! Each clicker is still protected by a plastic covering. The absolute best deal anywhere for a teacher response system. If you have any questions about this product by ResponseCard, contact us by completing and submitting the form below. If you are looking for a specif part number, please include it with your message.